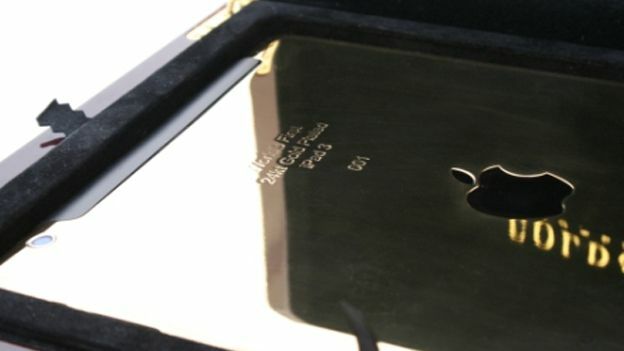 Gold & Co, a London/Dubai based company, has produced the worlds first 24KT gold plated new iPad. The first one will be displayed at the biggest shopping mall in Dubai before being auctioned off – all profits going to charity. Only 250 of these iPads will be made so you will have to be quick if you want to get in on the act. Obviously the price is ramped up a bit. A 'standard' 64gb 4G WIFI iPad will set you back £659. The 24KT version will cost a whopping $4,599 (£3453). One advantage from the gold is that it would offer better cooling than the current casing of the iPad, potentially eradicate the overheating problems that have been reported. Would you want a 24KT gold iPad? Let us know via the T3 Twitter and Facebook feeds.